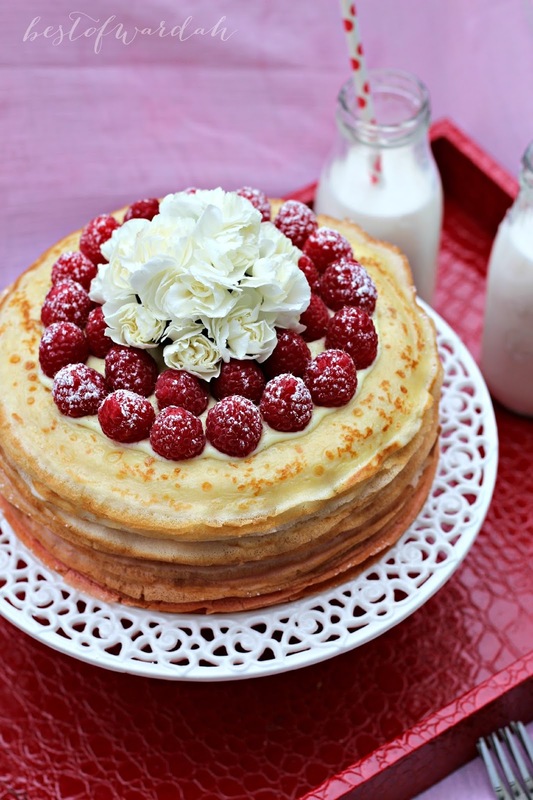 Making a crepe cake has been at the top of my baking bucket list for a long time. 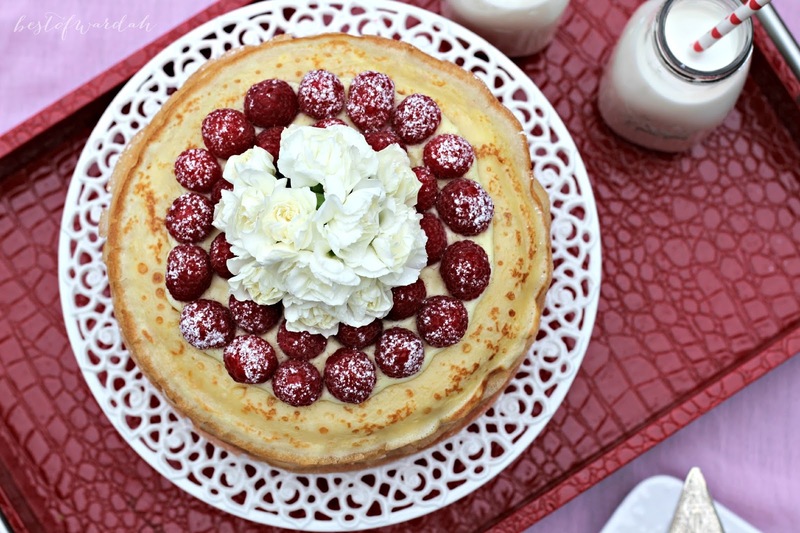 When Lindsay at Love and Olive Oil did a kitchen challenge for crepe cakes, it was just the push I needed to make it. I finally got the perfect opportunity to make it when I had a couple friends over. That meant enough people to help me finish off the cake. This cake is definitely not a quick fix cake. Also called a mille fuelle, or a thousand layered cake, it takes a lot of time and dedication to create this spectacular, almost fairy like cake. 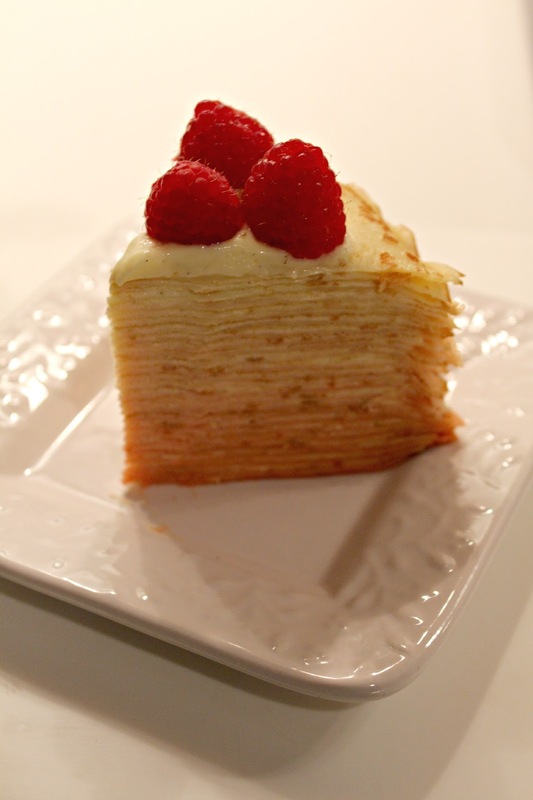 The crepe layers are delicate and the end product is delicious. It is definitely something you all have to add to your bucket lists too. Now, though this cake is really time consuming, it's pretty straightforward. First you just make all the crepes and filling, which you can do a day in advance. 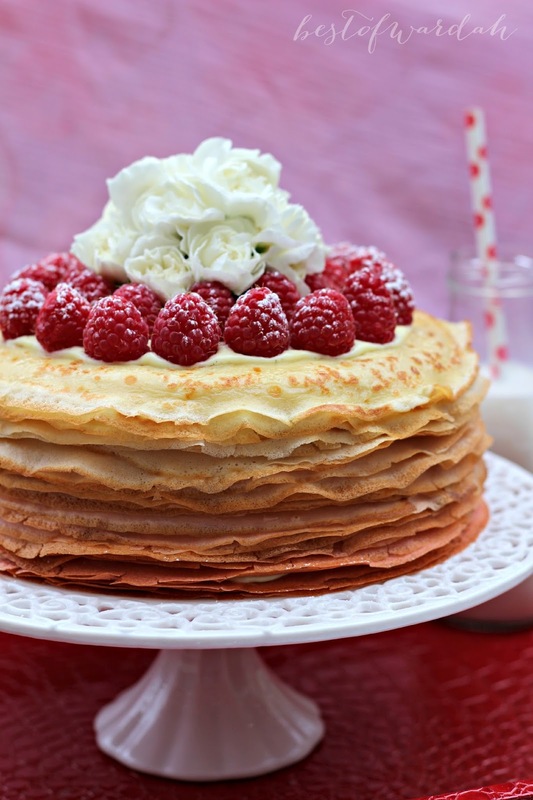 Then, you need to assemble it by layering crepes and filling. All together, over 2 days, this cake took me around 4 hours to make. Split the vanilla bean length wise and use the back of a knife to scrape out the seeds. In a medium bowl, whisk together egg yolks, sifted cornstarch, and remaining 1/4 cup sugar. Sieve the mixture into a bowl with butter in it. Discard the vanilla bean. Beat until the butter melts and the mixture cools, about 5 minutes. Step 1- Make crepes! I have the perfect recipe for crepes with full instructions here. For this cake, I used a 9.5" non stick pan and 1 and halfed the recipe. Total, I had around 30 crepes. Step 2- To make the ombre effect, add a couple drops of food color to the crepe batter after you make 3-4 crepes. Once you've made 3-4 crepes of the new color, add 1-2 more drops. Keep doing this until you run out of batter. Step 3- To assemble the cake, beat the refrigerated pastry cream until it is smooth again. Fold in 1/2 cup of whipped heavy cream for a lighter pastry cream. Start with the darkest crepe on the bottom. Put 1.5 - 2 tablespoons of the filling on to the crepe. Use on offset spatula to smooth the filling evenly leaving just the curly border of the crepe untouched. Repeat until you've used all the filling and crepes. 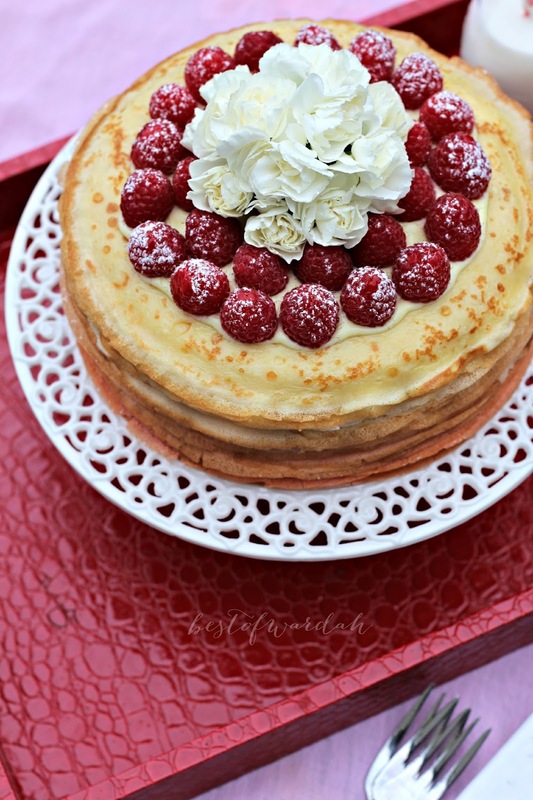 Step 4- Decorate the cake using raspberries or flowers. Use the last 1-2 tbs of filling as a glue for your raspberries. Step 5- Leave the cake to set in the fridge for at least a day. Before you serve, leave the cake at room temperature for 1 hour to get the best results. Here is a really bad picture I quickly took of the ombre effect. It looked beautiful in person. Kezia Skin Expert Dermatology hardir memberikan solusi terbaik untuk perawatan kecantikan kulit dan wajah anda. Produk pemutih wajah alami terbaik yang diramu secara khusus untuk kulit wanita Asia. Mengandalkan bahan-bahan alami sebagai bahan dasar membuat produk ini menjadi terbaik dan aman untuk digunakan sehari-hari. Mampu menjadikan kulit wajah lebih bersih, lembut, dan cerah merona.